IPL therapy is an extremely effective treatment for the rejuvenation of the skin and hair removal. An intensive pulse light laser treatment also known as IPL, Photofacial, Epifacial…) can be used for treating various skin problems and improving imperfections. It can be used on all areas of the body and face and it is a very popular procedure for both men and women of all ages. It is an excellent nonsurgical treatment for preventative anti-aging solutions, maintenance, or it can dramatically improve multiple conditions. Treatments can be very helpful in erasing minor sun damage such as age spots, freckles, correcting hyperpigmentation and uneven tones. It is also helpful for spider veins, minimizing enlarged pores, birth marks, mild to moderate acne, and eliminating the redness and facial flushing associated with Rosacea. This light based technique targets a problematic area that pulses a range of different wavelengths of light directly to the area. IPL uses this energy to also encourage new collagen protein, and stimulate elastin, resulting in a smoother, supple complexion. Treatments are quick, safe, and often times, showing immediate results. IPL systems can target and combine several different conditions together and treat them at the same time. IPL treatments are often described as a “slightly uncomfortable, rubber band snap sensation” as the intense pulse light rays are administered in repetitive spurts to a specific area. The targeted area is absorbed by the light and damaged, leaving the surrounding tissue untouched. A slight red, flushed look may be experienced in the treated area immediately after the procedure usually lasting an hour or two. IPL is a gradual process that is the most effective, if they are performed over a course of sessions, usually at three-week intervals. 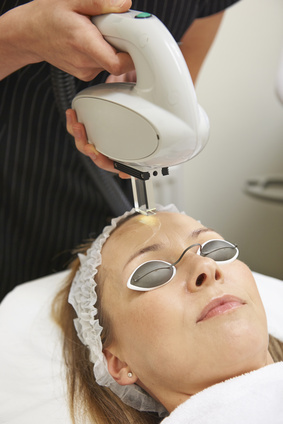 Each treatment will show improved results and will continue to rejuvenate and reverse damage over time. To maintain the improvement that has been achieved following an ipl light therapy treatment always protect the area with sunscreen. Occasional maintenance treatments are recommended 2-3 times per year. IPL has become one of the most popular cosmetic procedures because It works! Amazing cosmetic results with minimal discomfort and no “down-time! With advances in technology home-based photo facial devices are available. These hand held facial beauty devices utilize the technology similar to a professional intensive pulse light laser treatment but at a safe power level designed for home use. Baby Quasar - Designed with four wave lengths of intensive pulse light it is the most powerful consumer device available today.